If you know my tastes at all, you’ll know that a good mix of YA, Dystopia and Fantasy are right up my alley, and that’s what this first installment of the series does. The other bit that i LOVE is that it’s centered around New York, so it gives me a more realistic sense of what’s going on. Since it’s my ‘hood’ so to speak, i can really relate to things – and worry about what’s to come in the future. What we have here is a story about the last living bits of humanity, as a result of a virus that was released that basically killed everyone off. In addition to the story of survival and the quest to find a cure, there’s also the issue of other groups that are trying to kill off the humans. there is The Voice which are humans, but rebels so to speak. they don’t agree with what the government is doing and are fighting against it. Then there are the Partials where were genetically modified and somewhat manufactured people that aren’t aging, that have ‘super powers’ in the sense that they are super strong and resilient to things. The thought is that Partials are responsible for RM – the virus that killed everyone off and that they may hold the cure. At least that’s what our heroine Kira thinks. This story takes us on the journey of Kira – a 16 yr old who has a lot going for her yet wants to solve the world’s problems. She’s a medic for one, who has the curiosity to want to learn more, the love of her boyfriend Marcus who’s also a medic, and the close knit group of her adopted family. (since no one is true blood relation anymore aside from Madison and Jayden). Kira works in the maternity ward, trying to figure out why newborns cannot survive. they are born healthy but within a day or 2, RM takes over and kills them. Kira thinks that the cure lies within the Partials and decides that they need to capture one to study and see if there’s a cure. This is where things get dicey. The question then becomes who will come with her, who will turn her in to the Senate, will things be easy, and is everything what it seems? Of course, things are never straight forward, and this story takes us on the roller coaster of fear, survival, death, and perhaps a bit of optimism of what’s to come. Can Kira find a way to save her friend’s baby and the future of the human race? This becomes even more complicated when she starts to learn more about partials from Samm, the one that they capture. She learns that maybe they aren’t all what they seem…..or are they? I really enjoyed where this story took us. I for one never fully trust anyone’s motives in stories like this, and we learn that you should always be wary in this first intro to the series. There were twists that i wasn’t at all surprised about, granted Mr. Wells did hint at them throughout. Where this story leaves us off as a lead in to the 2nd book is a nice cliff. You’re left to wonder who’s still alive, how long they will live, and which groups are going to last or be split apart. We know that Kira’s very strong minded and won’t sit back and take what people say and do to her. The question is whether or not she can make a difference and if she can do it fast enough. I’ll have to keep reading i suppose, in order to find out, but i’ll tackle that one shortly. If you haven’t started the series yet, check it out. I just saw that book 3 comes out next tuesday, so i have to read fast if i want to catch up in time for the release. Enjoy! 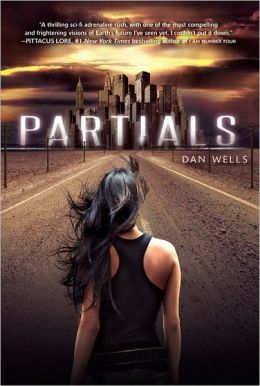 This entry was posted in Dystopian, fantasy, Reviews, Young Adult and tagged Dan Wells, Dystopian, fantasy, Partials, YA by iscm13. Bookmark the permalink.